Long before Michelle Kuo (2007 Fellow) was a student at Harvard Law School, a law clerk for the Ninth Circuit, or a Skadden Fellow for La Raza in Oakland, she was a member of Teach for America in Helena, Arkansas. There, on the border of Mississippi, in one of the poorest counties in the United States, Michelle got to know Patrick Browning, a student who took to her rigorous teaching methods and excelled against the odds of his circumstances. While she was eager to stay in the Delta and commit herself to teaching, her future called—she decided to attend Harvard Law School as a Paul & Daisy Soros Fellow and said goodbye to Patrick and the Delta. But three years later, as she was about to graduate, she found out that Patrick had been accused of murder. Devastated, Michelle returned to Helena and spent the next seven months visiting, reading, and writing with Patrick as he awaited trial in jail. Michelle’s new memoir chronicles their time together grappling with Frederick Douglass, James Baldwin and what privilege and inequality truly mean. Reading with Patrick is being published by Random House and will be released on July 11, 2017. We talked with Michelle, who is the daughter of Taiwanese immigrants and who now teaches at the American University of Paris. Congratulations on your memoir! How long has this been in the works? I suppose I’ve been working on the book for seven years now. But for most of those years, I was working full-time. Often I wrote very early in the morning and at strange hours. I’ve heard a writer describe the process of writing a book as keeping a hostage in your house—that you must return daily, feeding and tending to your captive, often in secret. That’s how I felt, which I know sounds perverse. What do you hope readers will come away with after reading the book? I hope readers think about the kinds of connections and relationships that we try to make in our lives. Who are the people we try to connect to? How different are they from us? As liberals we attack, as a matter of principle and habit, social conditions of inequality. We know inequality alienates us from one another. We know it fragments us into insular communities. We know, as Marx teaches us, that it divides a person from himself, enabling him to prize his self-interest above all other concerns. But I hope readers feel viscerally one human consequence of that inequality—that for two people to attempt to forge a truly equal relationship in an unequal society is painful, difficult, and likely impossible. Patrick and I come together in the classroom in the Mississippi Delta, a rural area starved for resources. He’s fifteen at the time and I’ve just graduated from college. He flourishes at reading, and I get him to come regularly to school. But then I leave the Delta—this is a place where people with means leave. I move on and progress; he gets arrested, goes to jail. And as we grow older, the inequality grows. 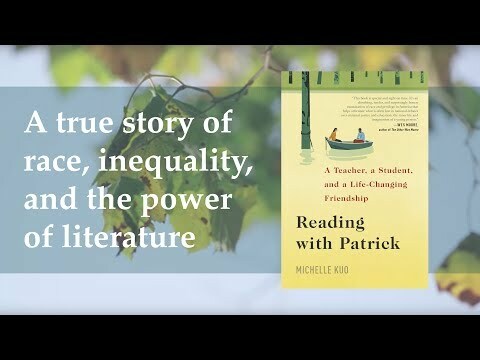 Still—and here’s the hope in the book—it’s through reading that Patrick and I experience, if temporarily, that equality. We read James Baldwin. We learn new stories. We talk about our favorite lines. If you think about the feeling of hearing music with others, it seems intuitively true that your joy is no more valid than any other listener—there’s equality in joy, in astonishment. I hope my book shows that the written word is music, too. I hope readers sense the mystery in which Patrick and I share: I am moved by these lines, why am I so moved? the memoir speaks to the power of literature and its ability to change lives. Was there one book or piece of writing that was particularly important to Patrick during those seven months? Yes—Narrative of the Life of Frederick Douglass. When I introduced it to Patrick, I didn’t think about too hard about the choice —I thought of Frederick Douglass as a hero, not a man. I thought it was a way to learn about American history. And I assumed that the book would bring us together, in shared contempt for slavery. But the book moved Patrick in a way that I cannot understand—in a way that at once deepened him and further divided him from everyone else. There is a devastating scene in which Douglass talks about how, during the holidays, the masters gave slaves gin, knowing the slaves would get very drunk. This was a tactic of the masters—to disgust them with their freedom and to show them they weren’t suited for freedom. Patrick was so disturbed by this scene that he wanted to stop reading. But then he kept going. The fact that Douglass taught himself to read and write was also moving. Douglass forged his master’s hand to escape; he literally wrote his pass to freedom. That is a powerful idea that speaks to the hopes that we invest in literacy. Growing up, was there one piece of literature that was particularly important to you? Oh! So hard to answer! I loved so much. Invisible Man. Anna Karenina. Middlemarch. Malcolm X. It’s hard to pin down one thing, but I will say that, in the scarcity of Asian American texts, I think I was starved for books that showed an authentic search for identity, and how to forge one’s personality through political and spiritual struggle. The black literature I’d read, in particular Ralph Ellison and Malcolm X (I know, totally different voices) especially galvanized me. I was a shy kid who was terrified of raising my hand, and reading this literature urged me to speak up. It sounds like you really struggled with your decision to go to law school. What advice would you give to Fellows who aren’t sure whether to leave the “real world” or pursue a degree that might help them make a bigger impact in the long run? If you’re on the fence, I think waiting is good. I don’t feel this way about most things in life—I’m impatient and want people to seize opportunities, quit jobs that they hate, and dive into battles for justice. But some of the most profound personal joys come from waiting—namely, the joy of finding the right person to love and the joy of knowing what you were put on earth to do. A person in search for her vocation is more likely to figure it out by experiencing a range of work and communities. Immediately following law school, options narrow because of debt and the pressure to get a decently paying and not-totally-non-law-related job. Children of immigrants are often given the opposite message: don’t wait, march forward, hurry! Hurry before it’s too late! I understand where that comes from. Just as a good doctor recommends the safest treatments, so the parent, afraid, recommends the objectively most secure route. But if a person has already achieved some level of health, there’s no reason to proceed as if sick. If we’re talking about working as an organizer, an artist, an activist, a teacher—why rush? These experiences deepen one’s whole being and eventually make her a compelling law student and lawyer. Obviously, there are always exceptions. If a person is undocumented and attending law school is her dream, yes, go for it! Or, if a person already knows which legal field she plans to pursue and has experienced that field from nonlegal perspectives—go for it. Or, as with one college student I had—she wanted her aging parents to see her graduate from law school. I get it. How did your parents feel about your return to Helena? Marquee photo: Patrick Browning and Michelle Kuo in November of 2016. Photo: Kathy Huang.